I'm having a fabulous Friday and feeling good because I'm heading to a friend's wedding in Tahoe. That inspired me to make the environmental organization, League to Save Lake Tahoe the subject of today's Feel Good Friday. Lake Tahoe, located in Northern California is the largest Alpine lake in North America. If you live in, or have ever visited California, you've likely seen the iconic blue sticker declaring the mission to "Keep Tahoe Blue". More details can be found on their website: "The League to Save Lake Tahoe is dedicated to protecting and restoring the environmental health, sustainability, and scenic beauty of the Lake Tahoe Basin. We focus on water quality and its clarity for the preservation of a pristine Lake for future generations." Founded in 1957, "the League focus has been monitoring development and recreation plans, and working with local, state and federal lawmakers to save Lake Tahoe." With over 6,000 members in 46 states the League has helped secure millions of dollars of public funding, advocated for limited development on wetlands and led the effort to ban two-stroke jet skis. Specific and practical examples include sweeping and marking storm drains, increasing public transit and launching a bike share program, forest stewardship days, a program that trains visitors to identify and report aquatic invasive plants, regional stormwater monitoring and the traditional beach clean up. 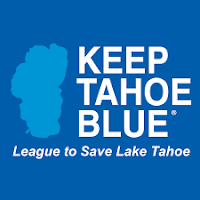 If you're inspired to do your part to Keep Tahoe Blue you can donate, volunteer, shop (a bumper sticker is only $2) and follow the social media buzz by liking the Facebook page and following them on Twitter @KeepTahoeBlue. Click here for more Tahoe fun facts and if you can, plan a visit!